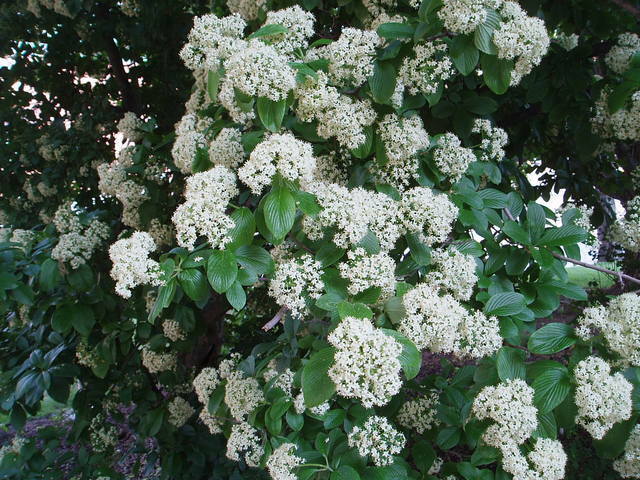 Viburnum sieboldii is a shrub to 6 m tall; usually a small tree, colonial by root sprouts; open habit, branches stout, new growth green, finely hairy, older twigs pale gray-brown, leaf scars connected around stem, winter buds brown, oblong with two bud-scales as long as the bud. Leaves opposite, stalk 0.8-1.5 cm, blade oblong, 6-12 cm long, about 4 cm, widest at or above middle, tip pointed to blunt, base broadly wedge-shaped, (leaves on new shoots sometimes larger), lustrous dark green above, hairy on veins below, hairs radiating from a central point (use lens), veins numerous, parallel, sharply impressed above, crushed leaves foul smelling, margin coarsely toothed. 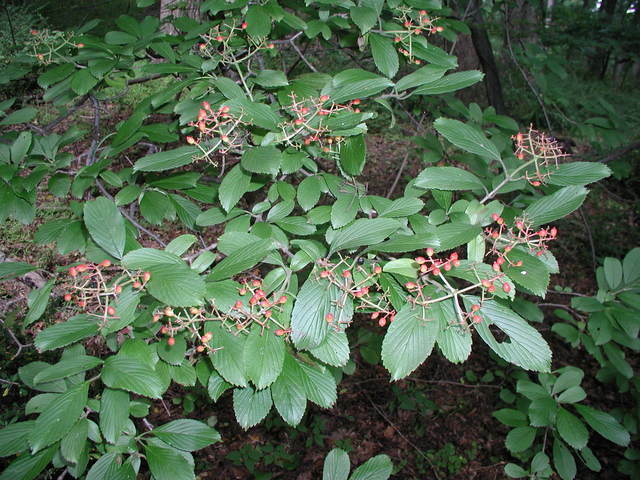 Viburnum sieboldii. flowers. © Les Mehrhoff, 2008-2010. I_LJM5938. discoverlife.org (Accessed 4/2017). Flowers dull white, 0.8 cm wide; inflorescence rounded 7-10 cm diameter. Fruit: fleshy, oblong, 1 cm, red, becoming black when ripe. Seeds dispersed by birds. Frequency in NYC: Occasional to locally common. Habitat: Forest understories and semi-shade. Recently escaped from cultivation in parks in the Bronx and Queens, possibly elsewhere. Found in forest soil pH 5.6 (Gargiullo unpublished data). Notes: Has potential of being invasive (Dirr, 1990; Kunstler, 1993; Rehder, 1986).